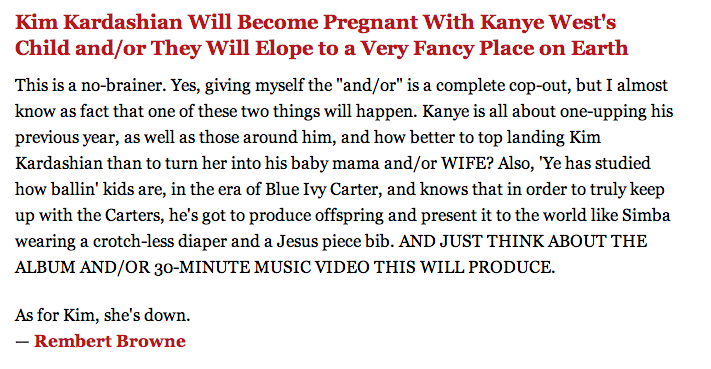 » The KimYe Baby: Sign of the Apocalypse or Dawning of the Age of Aquarius? 1. Video of Michelle Obama from a never-released Uncle Luke video surfacing. 2. Video of Barack Obama from a never-released Uncle Luke video surfacing. 3. Sasha Obama being implicated in a Sidwell Friends multiplication test cheating scandal. 4. 2 Chainz showing up at my house, wanting his hair braided. Aunt obliging. 5. 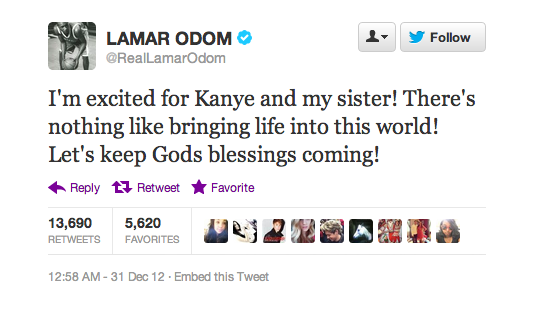 Word getting out that Kim Kardashian is pregnant. 6. Trinidad James taking me on a sweaty shopping spree. 7. High school basketball phenom Jabari Parker reneging on his commitment to Duke, deciding instead to play at Dartmouth. 8. A Waffle House opening in Manhattan. Well, wouldn’t you know it, no. 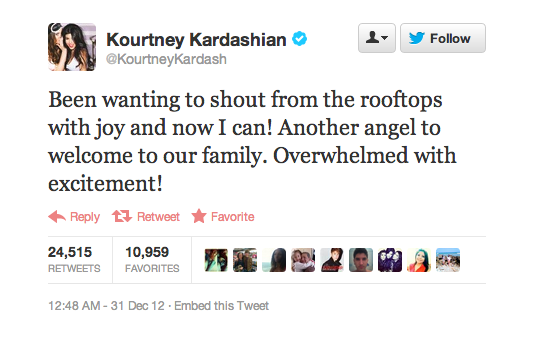 5 took place in the wee hours of December 31, New Year’s Eve, 2012. Make some noise for my baby mama. While he says it, he makes this face, which is precious. 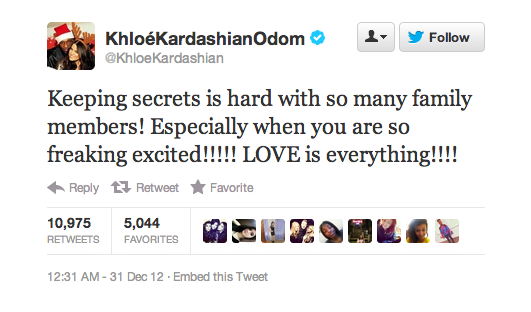 … had me thinking there might be some weight to these concert tweets. I mean, Kanye would be the one to just say this in jest, because he is a legendary troller of America, but when has the beauty salon ever really been wrong? Knowing that, I retweeted everything I could find. Even if it wasn’t planned, God brought us a whole new plan. 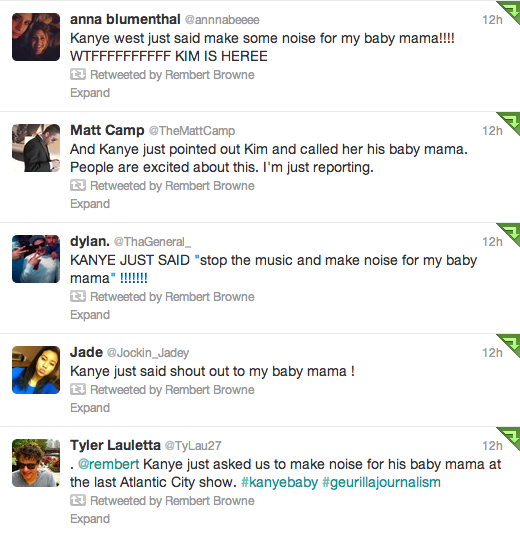 I don’t think y’all quite understand what I’m saying … ’cause now you’re having my baby. You’re having my baby and you mean so much to me. Where was Kim while all of this was happening? 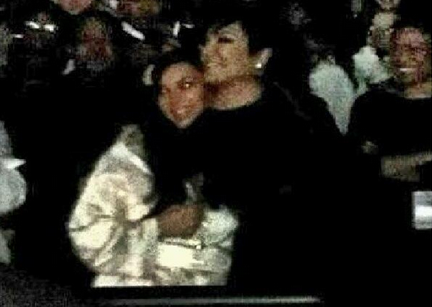 In the crowd, spotted (obvi) by KardashianFan29, with mom Kris, smiling and, reportedly, CRYING. Seems like a confirmation of this not being a joke. 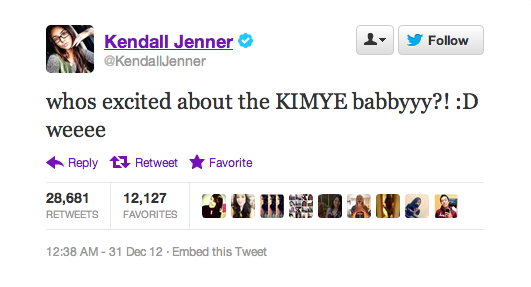 KIM IS HAVING KANYE’S BABY. And then the family came out of the woodwork, turning everyone’s my greatest dreams into a reality. So there it is. 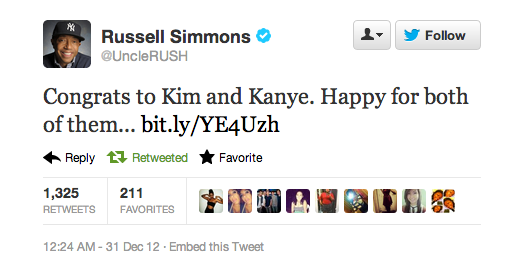 Kim Kardashian and Kanye West are having a child. This will, for better or worse, be something that dominates news, reality television, the Internet, MySpace, Pinterest, and any other medium worth being dominated for the next seven months, so that’s just something we should be prepared for. As for final thoughts, in these, our last few hours of 2012, I’m going to brag in CAPS LOCK AND SOMETIMES IT WILL BE IN BOLD ITALICS. 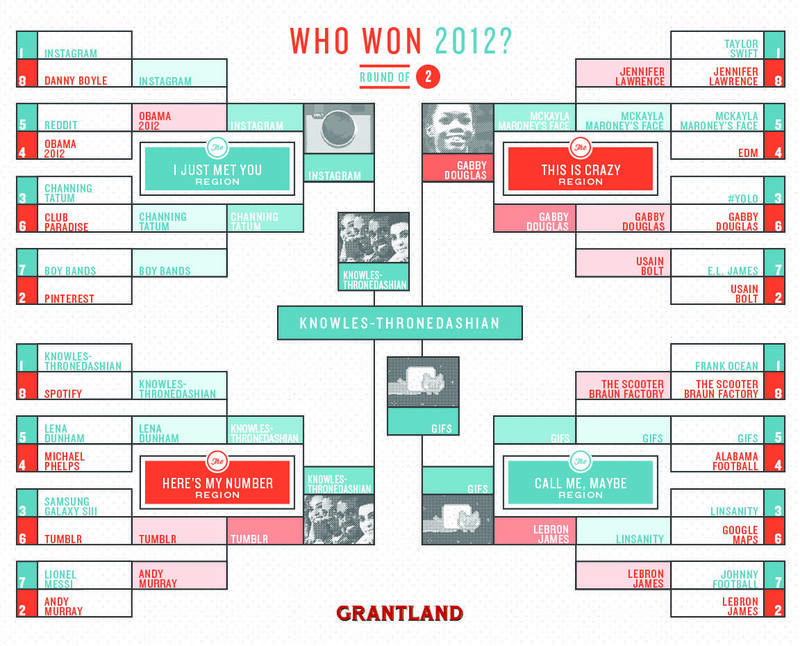 GRANTLAND 2013 PREDICTIONS, WHAT UP? I WAS SO SPOT-ON ABOUT THIS, I WAS EARLY. WHAT UPPPPP. END-OF-THE-YEAR BRACKET. WAIT, WHO WON AGAIN? LONG LIVE THE KNOWLES-THRONEDASHIANS, ILLUMINATI COUSINS AND FUTURE PTA BOARD MEMBERS.